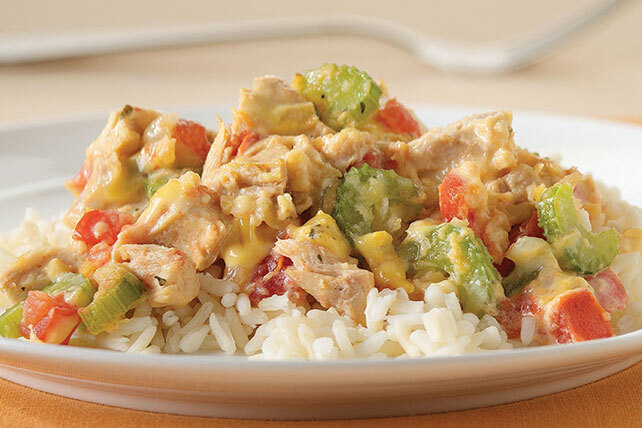 Stay in for date night with this Creole Tuna and Rice. The flavorful dish for two is super easy to make and only requires 10 minutes of prep! Cook and stir celery and onion in butter in large skillet on medium heat until crisp-tender. Add flour; stir until well blended. Add tomatoes, tuna, VELVEETA and basil; cook until VELVEETA is completely melted, stirring occasionally. Substitute 1/2 cup cooked cleaned shrimp for the tuna. Add with the celery and onion.